Looking for a bus in Scottsdale? Phoenix Charter Bus Company has access to hundreds of buses to take you to Papago Park, Camelback Mountain, and more. Nestled in the Sonoran Desert, Scottsdale offers an exciting variety of activities to tourists and residents alike. From shopping at Arizona’s largest mall, to hiking through Pinnacle Peak Park, your group will never run out of places to explore. Need some rest and relaxation? Check into one of the city’s beautiful resorts, such as The Phoenician or the Four Seasons. To ensure your group arrives safely to every destination on your itinerary, call Phoenix Charter Bus company today at 480-445-9823. 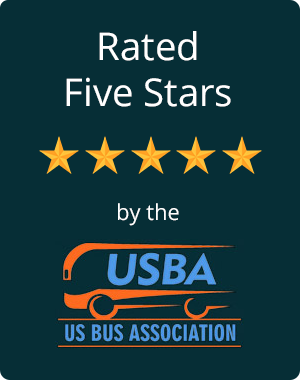 Our charter bus experts will help you book the right minibus or full-sized coach, complete with amenities to keep your group members comfortable and entertained along the way. Our team is available 24/7 to provide you with a no-obligation quote and walk you through our simple bus reservation process. If you are planning a group event in Scottsdale, we’ll help simplify your transportation with charter bus rentals you can trust. There is a bus for every occasion, including school field trips, corporate events, vacations with friends and family, sports events, weddings, and more. Each bus comes with a variety of amenities, such as reclining seats, television monitors, and power outlets, to keep your passengers comfortable and entertained during the ride. Long-distance trips into and out of Scottsdale can be monotonous, but a charter bus ride through the desert is anything but boring. You’ll be surrounded by your closest friends or colleagues, and you’ll have access to modern features like WiFi (available upon request) so you can stay connected to the world around you. If you’re coming to Scottsdale from Sky Harbor International Airport, book a shuttle bus to transport your group and luggage to your hotel. When you reserve your bus for the entirety of the trip, you’ll have a private ride to every destination on your itinerary without the need for public transportation or rideshare apps. For recommended things to do and see during your stay in Scottsdale, check out our family-friendly travel guide. Streamline your transportation plans today by calling Phoenix Charter Bus Company at 480-445-9823. Our reservation specialists will be more than happy to help you choose a minibus or charter bus that has the exact seating arrangements and amenities you need. After collecting specifics about your trip, such as pick up and drop off locations, we’ll provide you with a no-obligation quote. We can’t wait to partner with you for your next group trip in Arizona!